Automated Sciences offers the GOES Box, POES Box, Rapid Visualization Tool Workstation, LRIT Systems, and Multi Satellite Systems. These products are designed to directly ingest data sent from Environmental Satellites, store the data, and allow the user to work with the data using our included image processing software or access the raw data in various ways. Information about these products is provided below; for further information please contact us. If you are just getting started, you may find it helpful to visit Weather Satellite Systems 101. We are currently offering special promotional pricing on the GOES Box and RVT Workstion combination for NOAA GOES see Promotion Information for details. The GOES Box is a specialized computer system with a built-in receiver designed to both ingest and process data from the GOES satellites. 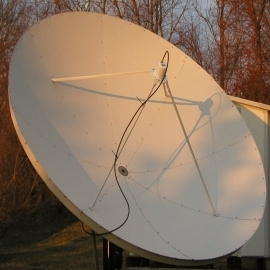 Our standard GOES Box is supplied with a specialized integrated feed with downconverter, and a 3.1 or 3.8 meter pointable fixed position satellite dish. Our popular multiuser SuperLooper animation and image processing software is included with the GOES Box. It is specifically designed to quickly and easily loop or animate a time lapse series of images. Versions of the GOES Box are available for NOAA GOES, JMA MTSAT, and CMA FY-2 satellites. For more detailed information about the GOES Box and the SuperLooper, please refer to our brochures below or contact us. The POES Box is a powerful, specialized computer system with a built-in receiver, designed to ingest and process data from POES satellites for meteorology, oceanology, land use management, or other purposes. Polar orbiting satellites provide highly detailed multispectral data with 1 km resolution, and each of the polar orbiting satellites provides at least two data sets daily. Our standard POES Box system is supplied with a 3 meter tower, azimuth and elevation rotors, a tracking controller, a 1.8 meter dish, and a specialized integrated feed. The POES Box also includes our POES Image Viewer software. For more detailed information about the POES Box, please refer to our brochure below or contact us. The Rapid Visualization Tool (RVT) Workstation is a specialized 64 bit PC workstation running our powerful RVT software that utilizes advanced 3D technology to show you a photo-realistic Earth with real-time weather satellite data mapped on top of it. 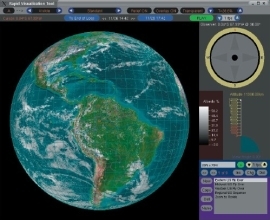 This photo-realistic Earth may be navigated around, as though you were the pilot of a spaceship - you may look at the Earth and the surrounding data from any perspective, controlling the position and altitude, and furthermore facing any compass direction or viewing the earth from any angle. In the RVT, the operator can change any combination of the viewing channel, position, altitude, direction, and angle, and these changes take effect virtually instantaneously. The RVT allows users to animate data through time or space to fully observe and understand weather conditions. Time-lapse loop animations allow the operator to view the progression of weather systems. Traditional weather satellite systems limit you to only animating through time; the RVT also allows you to animate through space. Fly-throughs, or smooth animations through space, allow the user to rapidly view extended areas in a high degree of detail. The Slideshow mode of the RVT allows users to rapidly move through a sequence of their defined areas. The RVT allows you to display and enhance the standard satellite-provided spectral channels and informational channels that we derive from the satellite data. These include the visible, infrared, water vapor, sea surface temperature, and rainfall rate channels. Furthermore, the software allows for various overlays including cloud motion vectors, cities, political and geographic boundaries, or other user-defined landmarks. The RVT is also the ultimate product generation tool that allows you to easily and automatically export hundreds of different views as image files in real-time. The Image Gallery, comprised exclusively of images exported from the RVT, contains a section showcasing several of the RVT Features described here. The RVT obtains its data from a GOES Box or a POES Box. Multiple RVT Workstations can acquire their data from a single GOES or POES Box, or multiple GOES and POES Boxes may provide the RVT with data. For more detailed information about the Rapid Visualization Tool Workstation, please refer to our brochures below or contact us. Several years ago, member states of the World Meteorological Organization who operate weather satellites agreed to replace their traditional Weather Facsimile (WEFAX) transmission with Low-Rate Information Transmission (LRIT). LRIT data is a low resolution, digital image transmission format sent from various GOES satellites including NOAA GOES East and West, and MTSAT. 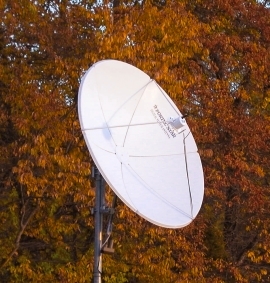 It can be received with a small 1 to 2 meter aperture dish, and can be run on a compact computer. The advantage of LRIT Systems is that their relatively small size makes them fairly portable, and thus LRIT is desirable in situations in which one wants to transport and quickly deploy a system. LRIT Systems may take different forms, depending on your organization's needs. Please contact us if you would like more information on our LRIT Systems. We combine the products listed above into systems that operate with multiple satellites. These systems include one or more GOES boxes - each of which works with a different GOES satellite, optionally a POES Box, and one or more RVT Workstations. In these multi-system packages, data is quickly and seamlessly moved between systems using giga-bit ethernet. We also are happy to combine our standard products with custom systems or software to create a package that meets your organization's requirements. For more information, please consult our MSS Brochure. As Multi Satellite Systems may vary depending on an organization's needs, please contact us to discuss which Multi Satellite System can best serve you.